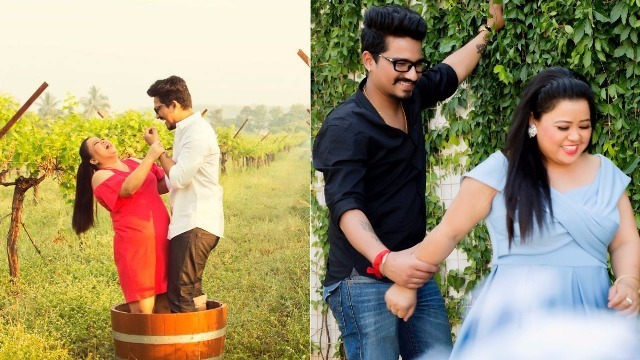 The most cutest couple Bharti Singh and fiance Haarsh Limbachiyaa are all set to tie the knot on December 3. The two have started prepping up for their wedding in the most unique way. Let us tell you that Bharti and her fiancé are going to release episodes of their wedding. Yes, the two will be sharing each glimpse of their wedding on YouTube as episodes for their fans. The celebrations for the wedding have already begun with the release of their first pre-wedding video. In the video, the couple can be seen romancing each other in the most adorable way. Bharti is looking extremely gorgeous. Nach Baliye 8 Contestant-Comedienne Bharti Singh Rushed To The Hospital, To Undergo Liver Surgery! The video also has a hilarious twist. For instance, Haarsh goes down on his knees with a box of engagement ring to propose her. When Bharti opens the box in his hands, she finds a ‘gulab jamun’ instead of a ring. Bharti eats away only to find the ring stuffed in the ‘gulab jamun’. Meanwhile, the three day wedding will take place in Goa and expected guests are all Telly and Bollywood biggies.